کاظمی, ملیحه سادات. (1393). و تعیین مدولهای کشسان در سازندهای کنگان Vp - Vs برآورد رابطه همبستگی و دالان در میدان پارس جنوبی. مجله ژئوفیزیک ایران, 8(1), 71-81. ملیحه سادات کاظمی. "و تعیین مدولهای کشسان در سازندهای کنگان Vp - Vs برآورد رابطه همبستگی و دالان در میدان پارس جنوبی". 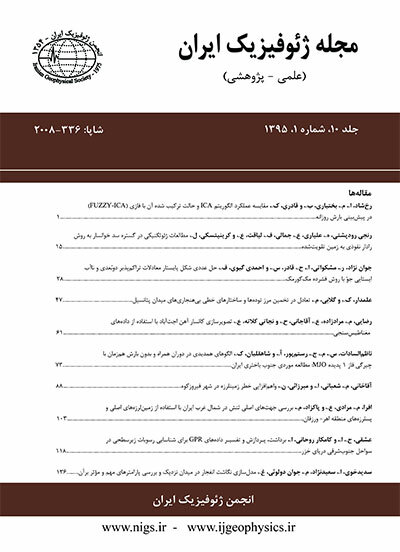 مجله ژئوفیزیک ایران, 8, 1, 1393, 71-81. کاظمی, ملیحه سادات. (1393). 'و تعیین مدولهای کشسان در سازندهای کنگان Vp - Vs برآورد رابطه همبستگی و دالان در میدان پارس جنوبی', مجله ژئوفیزیک ایران, 8(1), pp. 71-81. کاظمی, ملیحه سادات. و تعیین مدولهای کشسان در سازندهای کنگان Vp - Vs برآورد رابطه همبستگی و دالان در میدان پارس جنوبی. مجله ژئوفیزیک ایران, 1393; 8(1): 71-81. خاص هر منطقه بهتر است، روابط پیش گفته را برای نواحی گوناگون بهطور اختصاصی محاسبه کرد. رابطه همبستگی در نواحی فاقد شیل شباهت زیادی را آشکار می سازند. Geophysicists and engineers require both accurate and high-resolution seismic surveys. A detailed analysis of the interrelationships between seismic velocity, seismic attenuation, porosity, and permeability makes reliable predictions about the petrophysical properties of hydrocarbon reservoirs. Surface reflections, VSP and cross-hole seismic methods have been used to determine velocities and lithological discontinuities within a reservoir. Seismic velocities of the sedimentary rocks have been used as indicators of their petrophysical properties. Vp/Vs ratio is as a lithology indicator (Domenico, 1984). Vp/Vs can be used to discriminate between limestones and dolomites. Also, Vp/Vs has been used successfully for direct hydrocarbon detection, especially with AVO techniques. In general, the velocity ratio depends on the matrix of material, state of saturation, degree of consolidation, differential pressure, porosity and pore geometry. The effect of a fluid on Vp/Vs is significant, but not as much as that of lithology. Tight gas sandstones typically have a Vp/Vs value lower than 1.7, while shales usually have a Vp/Vs value higher than 1.7. The presence of gas-saturation in sandstones will even lower the Vp/Vs further (when the Vp/Vs ratio is close to 1.6) and overpressure can make Vp/Vs ratio even less (<1.5). These results can be used to interpret the seismic data in tight gas sandstones. Pickett (1963) demonstrated Vp/Vs as a lithology indicator. Castagna et al. (1985) introduced some empirical relations that relate Vp to Vs. Vp/Vs is sensitive to gas in most clastic reservoirs and Vp/Vs often shows a reduction due to the presence of gas (Kithas, 1976; McCormack et al., 1985). Castagna et al. (1993) published other empirical relations that relate Vp to Vs.
Elastic properties of rocks are also most important in determination of rock types. The elastic properties of rocks can be determined from the velocities of the longitudinal, transverse waves, and density. The Lamé parameter (λ) is a measure of a rock brittleness, which is a function of Young's modulus. This parameter plays an important role in the discrimination of gas sands from carbonates or shale in sedimentary rocks. Therefore, well logs are used to determine the elastic properties of rocks. A classical sonic log employs the acquisition and analysis of the data with a simple monopole source. In general, the compressional wave velocity is easily determinable in all rock types with a full-waveform sonic tool. A logging device which has been used to analyze the formations around the borehole is called Dipole Shear Sonic Imager (DSI). A dipole source generates the flexural modes, which determine the shear velocity. Since compressional waves travel faster than any other waves, travel times are easily determined from the first arrival for each receiver. For hard formations, where the shear wave velocity is greater than the fluid velocity of the P-wave, shear waves are present in the recorded wave trains. When the shear velocity is less than fluid velocity of P-wave, the shear mode does not exist for the monopole. The shear velocity can be determined either by inverting a Stoneley wave velocity, or by conducting a flexural mode survey. Inverting the Stoneley wave velocity for detection of shear velocity is a good technique in soft rocks. In this investigation logs from two wells in the South Pars Gas Field are analyzed. From the analysis of DSI, Vp-Vs relations are developed. However, the relations between elastic properties of rocks and petrophysical properties are found for calculation of elastic properties. For Kangan (K1 and K2) and Dalan (K3 and K4) formations, the relationships between Vp and Vs in two boreholes are determined. P-wave versus S-wave velocity crossplots for all layers show a good relationship. An estimation of S-wave velocity based on Vp was used for regions for which we did not have cores and log data. Relations between Vp and Vs for other parts of this field were found based on S-wave velocity as well. Finally, the bulk modulus, Young's modulus, shear modulus and λ are calculated based on the well log data. Anno, P. D., 1985, Exploration of the Hunton Group, Anadarko Basin, using shear waves: Presented at the 53rd Ann. Internat. Mtg., Soc. Expl. Geophys. Arroyo Franco, J. L., Mercado Ortiz, M. A., De, G. S., Renlie, L., and Williams, S., 2006, Sonic investigations in and around the borehole: Oilfield Review, 18, 14-33. Brie, A., 2001, Sonic measurements, Sonic measurements overview: Schlumberger report. Brocher, T. M., 2005, Empirical relations between elastic wave speeds and density in the Earth’s crust: Bull. Seism. Soc. Am., 95, 2081-2092. Castagna, J. P., Batzle, M. L., and Eastwood, R. L., 1985, Relationships between compressional wave and shear wave velocities in clastic silicate rocks: Geophysics, 50, 571-581. Castagna, J. P., Batzle, M. L., and Kan, T. K., 1993, Rock physics; The link between rock properties and AVO response, in Castagna, J. P., and Backus, M. M., Eds., Offset dependent reflectivity-Theory and practice of AVO analysis: Society of Exploration Geophysicists. Ensley, R. A., 1985, Evaluation of direct hydrocarbon indicators through comparison of compressional and shear wave data: Geophysics, 50, 37-48. Goldberg, D., and Gant, W. T., 1988, Shear-wave processing of sonic log waveforms in a limestone reservoir: Geophysics, 53, 668-676. Hornby, B., and Murphy, W. F., III, 1987, Vp/Vs in unconsolidated oil sands: Shear from Stoneley: Geophysics, 52, 502-513. Kithas, B. A., 1976, Lithology, gas detection, and rock properties from acoustic logging systems: Soc. Prof. Well Log Analysts 17th Annual Symp., R1-R10. Lee, M. W., 2003, Velocity ratio and its application to predicting velocities: U. S. Geological Survey Bulletin 2197. McCormack, M. D., Justice, M. G., and Sharp, W. W., 1985, A stratigraphic interpretation of shear and compressional wave seismic data for the Pennsylvanian Morrow formation of southeastern New Mexico: AAPG Memoir, 39, 225-239. Murphy, W., Reicher, A., and Hsu, K., 1992, Modulus decomposition of compressional and shear velocities in sand bodies: Geophysics, 58, 227–239. Pickett, G. R., 1963, Acoustic character logs and their applications in formation evaluation: Journal of Petroleum Technology, 15, 650–667. Rojas, E., 2008, Vp-Vs ratio sensitivity to pressure, fluid, and lithology changes in tight gas sandstones: First Break, 26, 83-86. Schlumberger, 2005, Cased hole DSI sonic processing report. Schon, J. H., 2011, Physical Properties of Rocks, Elsevier. Tatham, R. H., and Stoffa, P. L., 1976, Vp/Vs, A potential hydrocarbon indicator: Geophysics, 41, 837-849. Tatham, R. H., 1982, Vp/Vs and Lithology: Geophysics, 47, 336-344. Verwer, K., Kenter, J. A. M., Braaksma, H., and Van Lanen, X. M. T., 2008 ,Acoustic properties of carbonates: Effects of rock texture and implications for fluid substitution. Geophysics, 73, B51– B65. Wang, Z., 2000, Velocity relationships in granular rocks, seismic and acoustic velocities in reservoir rocks: Recent development, published by Society of Exploration Geophysicists, 3. Xu, X., Hofmann, R., Batzle, M., and Tshering, T., 2006, Influence of pore pressure on velocity in low-porosity sandstone: implications for time-lapse feasibility and pore pressure study: Geophysical Prospecting, 54(5), 565-57.